The Mátrabérc Endurance Tour has been organized by the Kolos Hanák Hiker Association since 1987.The track of the tour, which goes through the whole mountain from east to west, follows the main ridge of the Mátra. 99 % of the trace is trail,four fifth of it is usually one-track ridge, with amazing diversified view. One of the major characteristics of the whole distance is the various altitude, which is relatively big in comparison with other trails in Hungary. Thanks to these features Mátrabérc became one of the most frequented and prestigious endurance tours of Hungary during the past few decades. At the same time with the Mátrabérc Endurance Tour two other tours have been organized. One of them is the Kolos Hanák Endurance Tour between Kékes and Szurdokpüspöki since 1991. The other one is the Muzsla Endurance Tour between Galyatető and Szurdokpüspöki since 2005. More and more people took part in the Endurance Tour-at a run-in contest with each other or themselves for the better results. The fastest runners were usually the best trail runners of Hungary, which meant serious prestige for the winners. 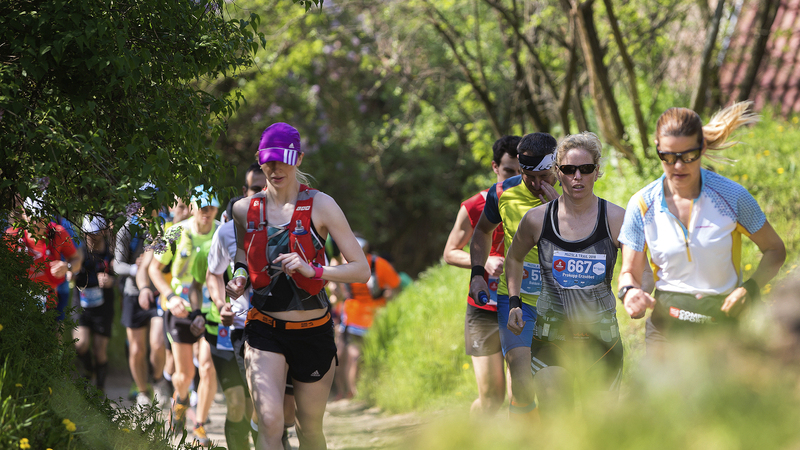 During the past few years the number of trail runners was getting higher and higher in Hungary. That’s why it was claimed to have “real challenging” contests. Most of them regarded the races in the Alps-especially the French and Italian ones- exemplary. For a long time they haven’t had a chance to fulfill the distance among race conditions although, it was one of the trails in Hungary which had the best features. In order to satisfy this demand-on the trace of the Endurance Tour-the Mátrabérc Trail Running race was born in 2010, where everybody can try out his abilities by running through the highest mountain of the country. The fame of the race soon crossed the country’s borders, which is proved by the increasing number of the international field year by year. The popularity of trail running has been rising in Hungary for years, which means more and more new “faces” who would like to be measured and contest at races. Lots of them have been dreaming about running on the peaks of the Mátra but physically they haven’t been ready for that yet. That’s why Muzsla Trail has been established for them. This race has similar difficulty level as Mátrabérc trail but the distance is shorter. We would like to give a chance to the participants of the Muzsla trail to experience the atmosphere of the Mátrabérc Trail and race together through Muzsla –which is considered to be the toughest stage of the race-with the contestants of the Mátrabérc Trail. Start: We take the first 20 kms on the route of the „National Blue Tour” from Sirok-Kőkútpuszta, which goes on the blue stripe tourist sign to the top of Kékes. After reaching Kékes we go westwards, behind the restaurant on the yellow stripe tourist sign. At the second junction we follow our path towards west on the yellow square tourist sign until we reach the forest house of Hidas. There we turn right and then follow our trail, which goes paralelly with the motor-road-on the blue stripe tourist sign until we reach the ridge of the Mátra. (This is the junction of the motor-roads of Parád-Galyatető). Between the two motor-roads the blue stripe sign takes us north-west to the top of the Csór-mount. We continue our trail on the blue stripe tourist sign until we reach the junction of the motor-road of Rudolf-tanya. From here we follow the red cross tourist sign towards north-west then west until we reach the parking lot of Galyatető. From the parking lot we continue our journey through the stairs towards north on the blue stripe tourist sign until we reach the belvedere. From there we go towards west until we reach the Observatory of Piszkés peak. At the ski lift we reach a wooden house. From the house we go towards east on the blue triangle tourist sign. After taking a 100 meters we turn towards north and we go down on the blue triangle sign till the forest house and then we climb up until we reach the belvedere of Vöröskő. After leaving the belvedere of Vöröskő we take 1.4 kms on the blue triangle tourist sign then we go towards west on the blue stripe tourist sign. After the junction of the tourist roads we reach the ridge on the blue stripe sign. Turning right at Szatmár-kő, the blue triangle tourist sign takes us to the top of Ágasvár. From the peak we continue our "adventure" on the blue triangle sign, which takes us to the tourist house. From the house the red cross tourist sign leads us to Csörgő-brook. Turning right there following the red stripe tourist sign we reach Mátrakeresztes on a short surfaced road. Going further on the red stripe sign we reach the Erdész-field first then the Nyikom-hogback. Going south upwards from the hogback on the red stripe sign we reach Ólom-top, then through a few peaks we reach Muzsla. Following the red stripe sign through Nagy-Koncsúr and Horka-peak we reach Diós-stream. Going across the stream we have to turn right where our trail leads us-among gardens and press houses-to Szurdokpüspöki. Going through the village-where plus signs help us we reach the building of the school, which is the finish as well. Start: The primary school of Szurdokpüspöki. We start our journey on the red and green stripe tourist signs towards gardens and press houses. In the valley of Diós-stream we follow the green stripe tourist sign through the top of Tilalmas. In the valley of Rédei-Nagy-stream we leave the green stripe tourist sign and follow our trail on the yellow cross and green square tourist signs upwards János vár. Reaching the top we go towards north on the green square sign towards Prédikálő top. After reaching the junction of Nagyparlag we go towards east on the yellow stripe tourist sign. Ou journey leads us through the pine forest of Korlát-kút then we reach the tourist house of Hidegkút. We continue our trail on the yellow stripe tourist sign and we reach Nagy-fields from where we can already see the houses of Mátrakeresztes. Reaching the main road of the village we turn left and continue our journey on a surfaced road. This leads us to the refreshing and checking point in the parking lot in Mátrakeresztes. From Mátrakeresztes we continue our journey on the route of the Mátrabérc trail towards Szurdokpüspöki. Going further on the red stripe sign we reach the Erdész-field first then the Nyikom-hogback. Going south upwards from the hogback on the red stripe sign we reach Ólom-top, then through a few peaks we reach Muzsla. Following the red stripe sign through Nagy-Koncsúr and Horka-peak we reach Diós-stream. Going across the stream we have to turn right where our trail leads us among gardens and press houses-to Szurdokpüspöki. Going through the village-where plus signs help us-we reach the building of the school,which is the finish as well.